Arbaspàa Tour Operator, post by post, will advise you about how to visit, will show you the curiosity of these wonderful lands and, as if you were a special friend, will tell you how to enjoy yourself and how to relax. Here are some suggestions for you: are you ready to take note? 1) Walking at sunset over the seafront of Spezia. It is at sunset the best time to appreciate the beauty of Passeggiata Morin, Molo Italia and Porto Mirabello. 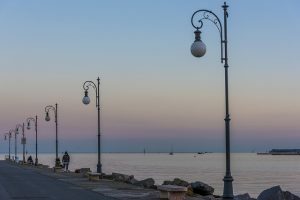 It doesn't matter if it's summer, one of the half-seasons or winter: thanks to the mild climate of the city, a promenade on the Gulf is a must, always enjoyable. A rite for the inhabitants, an experience to do for visitors. Walk on the pier that expands in the middle of the sea until to the red lighthouse at its end, one of the most beloved symbols of Spezia: on one side, the characteristic lanterns, on the other the tugs, the fishing boats with the nets laid on the ground, and the benches. The promenade, featuring its palm trees, offers a unique perspective and allows you to admire historic cannons and giant anchors that remind of the city's connection with the Navy. Passing through the modern Thaon de Revel pedestrian bridge, you will arrive to the Porto Mirabello Harbor, a boat and yacht harbor, and an ideal place to stop for an aperitif in one of its sophisticated bars or dine in an atmosphere ... as the Côte d'Azur. 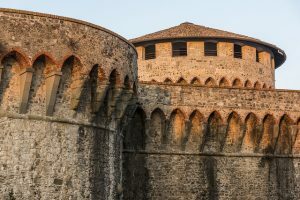 2) Visit the ancient fortresses of Sarzana. In the heart of the Val di Magra, there are two history chests that you can see, born in the Middle Ages, rebuilt in the Renaissance years and perfectly preserved until these days: the Firmafede fortress, called Cittadella (http://www.fortezzafirmafede.it/), located in the old town at the edge of the city walls, and the fortress of Sarzanello (http://www.fortezzadisarzanello.com/), built on the top of a hill not far from the city. Let yourself be transported back through the centuries, admiring the architecture, studying its defensive abilities, retracing its history; also, if scheduled during your stay, take part in one of the many cultural and entertainment initiatives the two fortifications usually host. 3) Learn how to prepare pesto. The most famous Ligurian green sauce made with pine nuts, garlic and basil, doesn't need to be presented: delicious with pasta, bruschetta, pizza, farinata (chickpea pie) and focaccia, is very appreciated by the local and the tourists. 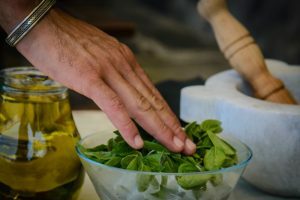 Thanks to Arbaspàa, you will learn how to make it with the traditional technique with the Pesto course Cinque Terre tour, using marble mortar and wood pestle, in two different locations: in Manarola (http://bit.ly/2wUPXoJ) and in Levanto (http://bit.ly/2xTIZRJ). At the end of the lesson, you will taste the goodness of the pesto made with your hands, spread on 'bruschetta' accompanied by a glass of local wine.